I had been feeling uneasy for a few days concerning Alex, my horse, like something dark was coming, although I did not know what. He was “summer lean”, as those in the horse world would say, but that is the norm for him. Physically, I could find nothing with him that would support my uneasiness. I started to tweak his diet, as I usually do this time of year anyway, to help him bulk up for the coming cold months, and I had already started to see him respond. All I could do from then on was continue to watch him from day to day, and hope that the dark cloud in my mind was imagined, and not the foreboding premonition that it felt like. The other day, when I woke up, the cloud was still there, along with a healthy case of nausea. I went to the barn to check on and turn out Alex and his stablemates, and noticed nothing wrong with him or any of the others. 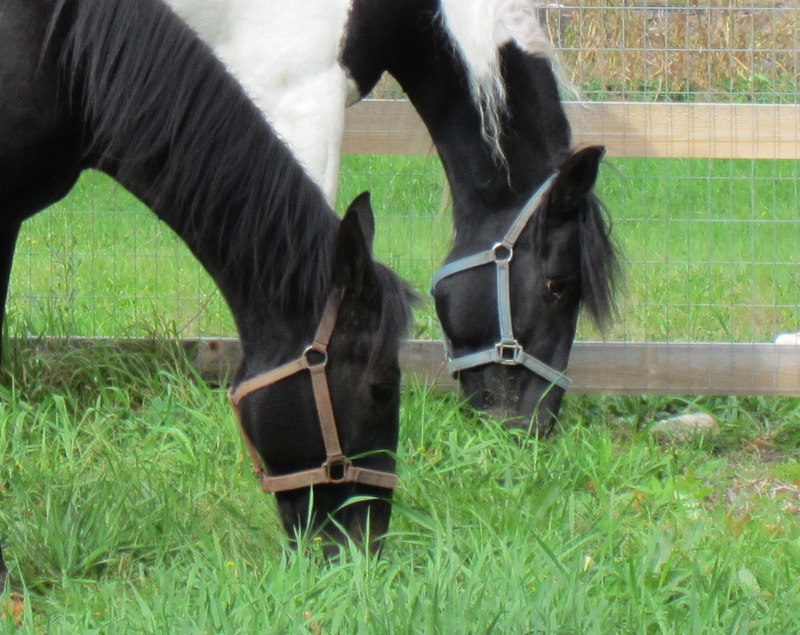 I set them up with fresh water and hay, then proceeded with my day on the road with Susan, my farrier friend. As usual, it was a good day, as I always enjoy her company, horse knowledge and wisdom, but I felt antsy throughout the day. The horses that I helped with that day all knew me well from past visits, and they knew that I was a bit off my game. The one thing about horses is that you can hide nothing from them. They see and feel everything, and I wasn’t able to interact with them as I usually do. I did my best to leave my uneasiness at the barn door, but I couldn’t, and they held me at leg and hoof’s length, both physically and mentally. The Man arrived home from work shortly after I did, and after spending some time with him before he ran into town on errands, I went out to replenish everyone’s fresh water and hay. I grabbed a few flakes of hay on the way through the barn, and as soon as I stepped into the back yard to greet the wee ones (both donkey and horse), their tension hit me like a wave. They were on high alert, especially the donkeys, and on first glance, I could see nothing wrong with either them or their surroundings. Then, I heard it. Heavy pounding coming from the big horse’s paddock. My first thought was that Diva had decided to play in the giant water trough, as she has a fondness for doing, but then realized that it couldn’t be her, as the pounding was too erratic, coming in a flurry for a few seconds, then stopping completely. I dropped the flakes of hay and headed towards the gate, not knowing what I would find, but it didn’t feel right. In seconds, I had reached the gate and was quickly scanning the field, hoping that I was wrong and that it actually was Diva who was gleefully destroying another water tub. And then I saw him. He was on his side, with most of his lower body inside one of the horse shelters, and he wasn’t moving, even when I called his name. My immediate thought was that I was too late for whatever was happening, and that he was dead, but as I neared him he started thrashing and kicking his legs up against the inside wall of the shelter. 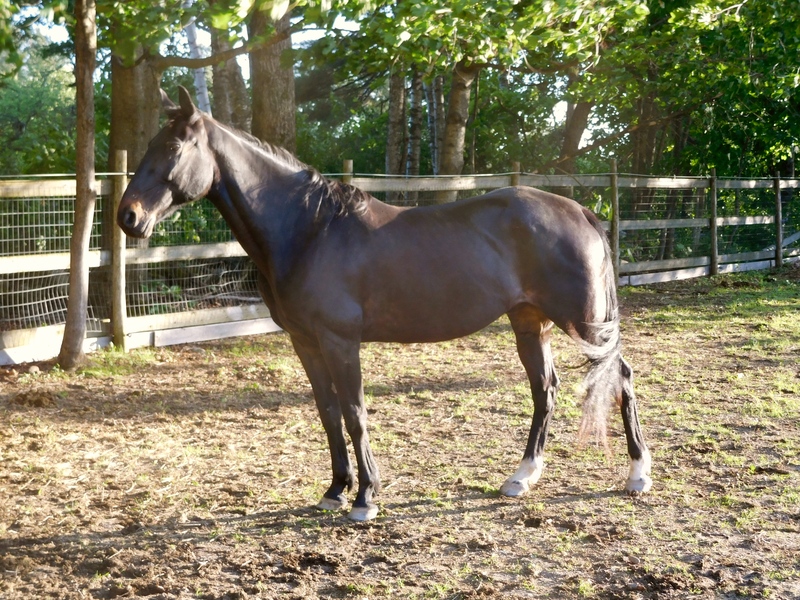 My mind shifted to colic, which in horses quite often can be deadly, and I knew I had to get him up and moving. He was clearly exhausted, and the panic in his movements mirrored what I saw in his eyes. Having just spent the day trying, and failing miserably, to keep my anxiety hidden from horses, I knew that this moment was key to whatever came next. I took a deep breath, centered my thoughts, and quietly said his name. “Alex” I whispered, as I knelt down beside him, laying one hand on his neck. His huge head swiveled towards me, and as he looked up at me, I saw the panic and fear in his eyes instantly disappear. I am not sure if a horse can feel relief, but in that moment, that is what I felt from him. 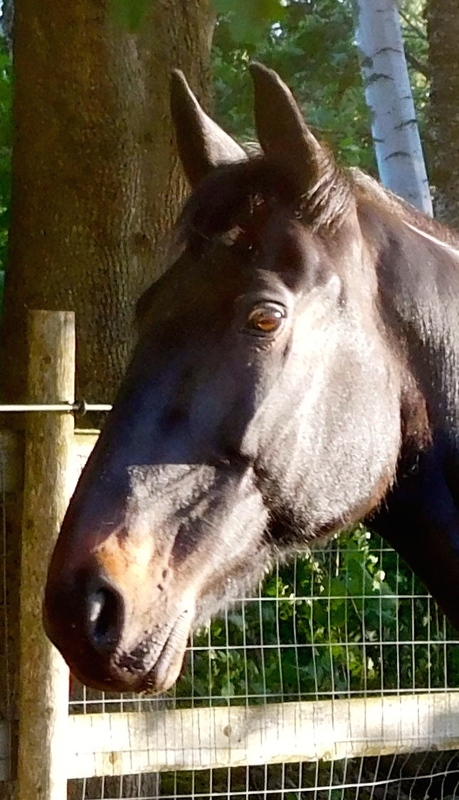 Good sign, I thought, for in my small handful of colic experiences, the discomfort and fear in a horse’s eyes that is feeling that much pain does not go away that quickly. After calling the Man, and asking for his help, I again knelt at my best friend’s side, trying to figure out what was happening. I soon realized that Alex had been trying to get up, most likely after napping or rolling in the dirt, and had become wedged up against the wall of the shelter. With no room to get his legs under him to either get up or simply roll over, he had spent all of his energy pounding his feet and legs against the close wall trying to move. He lay there breathing heavily, his muscles shaking and his eyes following me intently. Far from relieved at realizing it wasn’t colic that had brought him down, I now worried that he might have injured a leg, hoof, or somehow injured himself internally while struggling so heavily for who knows how long. Or, possibly, all of the above. I cradled his face with my hands, whispering to him that I was going to help, but that he had to preserve his strength so that he could help me help him when the time came. His eyes followed me as I rose, and as I turned towards the barn, I heard him sigh deeply. When I returned moments later with a halter and a lead, he had remained still and was waiting for me. I went behind him, and with my hands dug as much of the hard packed stone dust away from his body as I could to help him roll away from the wall. Wrapping the lead around his front legs and planting my feet, I looked him in the eye and whispered “Now, Alex, now!”. I knew me being able to pull him over was a long shot, but that was my only thought at the time. He kicked and arched his back, trying to roll over, with me pulling on his front legs with all of my might. It might have worked, and nearly did each time we tried, but his arching caused him to stop the roll with his head. 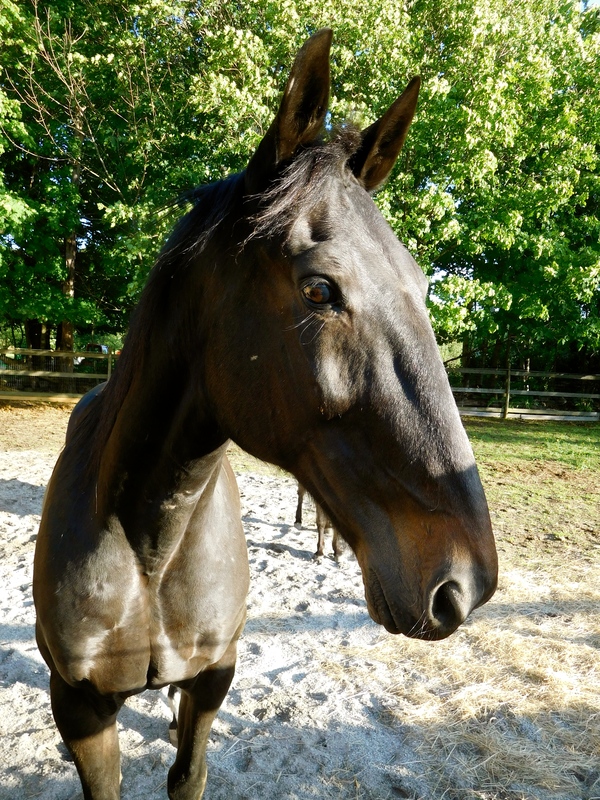 By the time the Man arrived, I had slipped the halter over Alex’s head, and while the Man braced himself to hold Alex’s head and halter still, I again wrapped the lead around his front legs. I met Alex’s never wavering gaze, and he knew it was time to try again. He pushed, I pulled, the Man held, and after much groaning and straining from all of us, and with the Man and I dodging flying hoofs, Alex rolled onto his left side and onto his feet. I held my breath, watching as he shook off the dirt like a phoenix rising from the ashes. With still held breath, I watched him run out of the shelter to greet Diva and Sassy, who had remained close throughout the whole ordeal. I had expected him to be limping after what he had gone through, and he was, though his head was high and majestic as he ran around the paddock a couple times, as if he were checking to see what worked and what didn’t. His body language told me all I needed to know for the time being, and as he ran and stretched his legs, the limp nearly disappeared. The Man and I continued to watch him for a few minutes, and after giving him some medicine to help with the muscle soreness, we left him in Diva and Sassy’s care, who continued to follow and watch him closely with concern. It wasn’t until a few hours later that we realized how scared those two must have been watching him struggle. He is their Alpha, and as with all of us here at the Farm, all things truly do revolve around him. I spent the next few hours cleaning stalls, and the Big 3 all had brand new, clean and dry bedding waiting for them when they came in for the night. Alex’s bedding was extra thick, because though he usually doesn’t lay down to sleep each night, I knew that on this particular night, the chances that he would rest those overworked and aching muscles were pretty high. When it came time for them to walk the short road that led from the field to the barn, I watched Alex closely for any signs of injury that might still be setting in. I could still see a slight limp in his back legs, but by morning, that would most likely be gone. His head was high, ears were alert, and the average man would see nothing that would indicate what had happened just a few short hours before. After everyone was settled into their stalls, happily munching on some grain and hay, I went to spend some time with Alex before turning out the lights for the night. He has never been one for being overly affectionate, so I wasn’t expecting anything different from him this night. True to form, he didn’t want to be fawned over, but he did lower his massive head, gently placing his forehead onto mine. We stood that way for about 10 seconds, eye to eye, then he turned back to his grain. For those 10 seconds, he offered love and gratitude in the only way that he knows how to show it. It was freely given, and gratefully accepted. He walked into the Barn as he always does, with authority and purpose, and as he passed the mini horse’s stall, the nightly routine of a few hoof stomps and a few snorts began. It never lasts very long, this display. It’s a nod to the resident wee horses that this Barn belongs to him, always has and always will. He was the first to be welcomed to the Farm, and with that comes a certain status that everyone who lives here, both four and two footed, is reminded of daily. On his testier days, he will include a high pitched whinny as an exclamation point, just in case nobody was listening. This night, however, he chose to forgo that extra proclamation, and went directly into his freshly cleaned stall where his nightly grain and hay awaited. After tucking his stablemates into their own stalls, I returned to his for our usual habit of quiet words and gentle scratches. 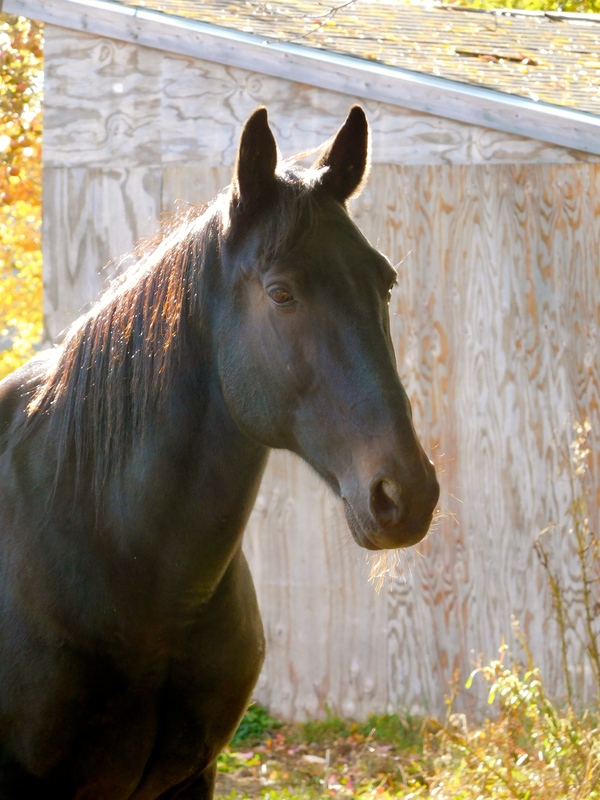 I quietly came up beside him and stretched out my hand to caress that special spot on his neck, but instead of leaning into me as he usually does, he quickly pulled away and walked to the front of his stall. It wasn’t the first time he had done this in the past, so I wasn’t taken aback in any way. Some would argue that perhaps he is a bit spoiled, with kingly expectations, and I’m good with that. He has earned that right as well as his commanded status. As I turned to leave his stall, I ruffled his mane and gently chided him that it was ok if he was tired and cranky, but he didn’t have to be rude. Before I could reach the door, I felt his warm nose on my back, and I felt his words “I’m sorry, don’t go. I am tired from the day, but I want you near.”. He returned to his grain bowl, and I moved to stand by his side. We stood there in silence, with him slowly chewing and me with just one still hand on his back. He sighed deeply, and relaxed to my touch. His majestic head lifted and slowly swung towards me, and when our eyes connected, I realized that I hadn’t been spending as much time with him as both he and I would like. My days here on the Farm during the summer are full, and although I work very hard to make sure that every critter living here has their share of quality time each day, once in awhile that isn’t enough. He took another deep breath, and then took a step back so that my face was level with his. As I had gently reprimanded him a few minutes before, he was now quietly chiding me. I instantly felt his need for closeness and connection, but most of all, I felt his love. After a few moments, the spell was broken, and he started chewing as he lifted his head to expose his neck. This time he accepted the gentle scratch, then lowered his head to rub his nose on my shoulder. Never one for wasted emotions, he then returned to his grain and hay, but now with an air more of contentment than of concern. I grabbed his favorite brush, and while he slowly chewed his hay with his eyes closed, I brushed away the dirt and sweat of the day. I carefully brushed his beautiful mane, taking out twigs that he had collected while browsing earlier in his field. Just as I thought he might be tiring of the attention, he shifted his weight and offered one front foot to be cleaned. I pulled my ever present hoof pick from my back pocket and set to work, with him offering up another foot as the last was finished. As I slipped the hoof pick back into my pocket, he rubbed his forehead on my back a few times, with a slight nudge towards the door. He was satisfied, and was telling me it was time to go. As I reached for the handle on his door, I felt one last nudge of his nose. “Aren’t you forgetting something?” he asked. I followed his gaze to my right front pocket, where chances were good that I might happen to have a couple of his favorite butterscotch horse treats. It was a safe bet, and all of the animals here on the Farm know that the same pocket almost always has something to nibble on. Soft fuzzy lips carefully took what was offered, and when the treats were gone, those same soft lips brushed my cheek and his butterscotch breath warmed my face. It is moments like this that I wish could last longer, but one cannot take or expect affection from a horse, only gratefully accept when it is freely given. With one final soft knicker, our time was done, and he returned to his hay. 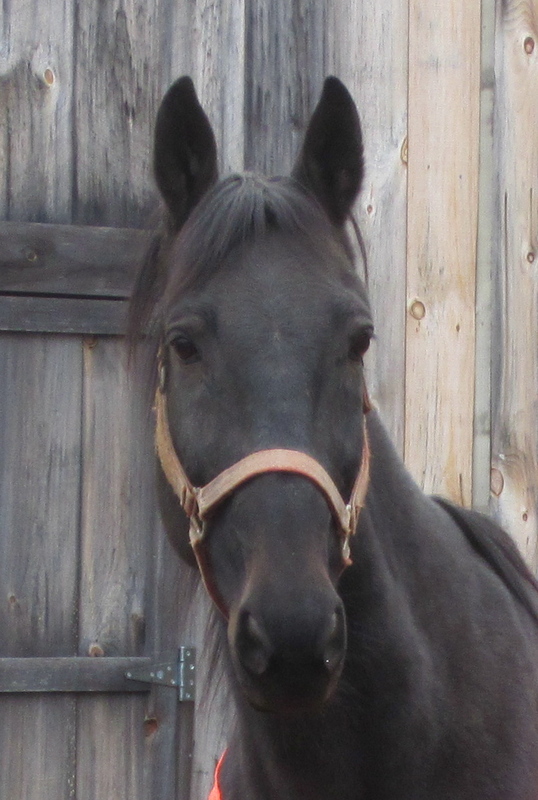 I closed his stall door, and gently slid the latch into place. I made the rounds one last time to check on the other Barn residents, securing doors and scratching noses. The Barn was quiet, except for chewing noises, and I knew that they were all content, and most importantly, felt loved. I glanced over one last time at him as I turned off the lights, and he was standing there, warm eyes watching me. “Good night, my friend. I love you.” I said. I slid the Barn door closed, and as I walked towards the house, I once again felt the warmth…and love…of fuzzy butterscotch kisses on my cheek. Our dream for the Farm has always been to return it to it’s glory days of years past, and this summer was our biggest step towards that goal. Our days , rain or shine, were spent putting up fences and rebuilding the big barn, making it ready for our expanding family. At the start of the summer, our plan was to add two horses, Alex and Chaser, to our fold, with no immediate plans for adding any others. Two was a good start, and the learning curve would be easier. 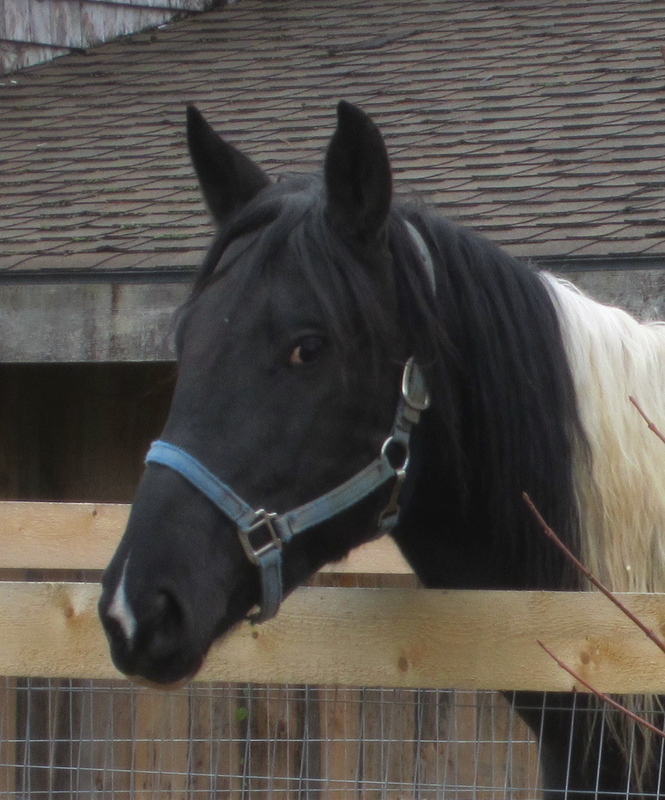 In July, we had crossed paths with a beautiful paint mare, and before we knew it, Diva had been added to the list. Our preparation had it’s share of setbacks, including having to completely rebuild half of the barn’s floor due to rot, but we slowly and surely made progress. With the finish line in sight, we learned that Chaser, the old man of the three, had become ill and passed away. Chaser had been one of the sweetest horses we’d ever met, and he would have been a great companion to Alex and Diva, as well as to us. Though we were sad, we knew that we still had a lot of work left to do, and we put our noses to the proverbial grindstone. We set a date and made arrangements, and before we knew it, the day had come.